Do you know the first pod system kit with LED screen? Have you seen a pod kit has no button and no setting? HQD Comma Kit is the first pod system kit with LED screen to check vaping status in the electronic cigarette industry, which is very unique in pod kits. Designed like a water drop, the HQD Comma looks very ergonomic and very convenient to use. It features a 380mAh rechargeable battery with 2ml refillable pod cartridges, and cover material is Zinc ally + PC, which looks very stylish. About this kit, the first thing you need to know is it has no button and no setting, all the information about quantity of power, puffs and other vaping data has been shown on the LED screen. Moreover, the output power range is from 20W to 40W, makes it a very suitable for new beginners. 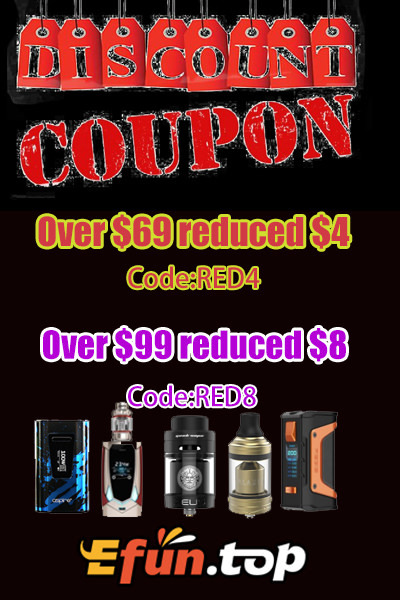 orderes over69$ reduced $4 with code "RED4" over$99 reduced $8 code "RED8"
if you have any questions please contact support@efun.top .We will be always with you !